AFTER waiting so long to realise his AFL dream, it should come as no surprise to anyone that Michael Barlow plays every game like it will be his last. On Saturday against the Gold Coast the classy midfielder will step out for his 100th appearance in Dockers colours. But on the eve of the milestone match, he said he was just trying to perform to the best of his ability each game. “Probably for me personally (the milestone) doesn’t mean a helluva lot,” he said. “One hundred games is no more significant than the previous 99 I’ve played. “It’s more significant to the people that have helped me along the journey and the people that are really close to me. Barlow’s story is one that almost never was. After being passed over by AFL clubs multiple times, Barlow was given a lifeline from a club far removed from his Shepparton roots. It was a rare opportunity for a 22-year-old in a competition that tends to rebuild their squads with 18 and 19-year-olds. 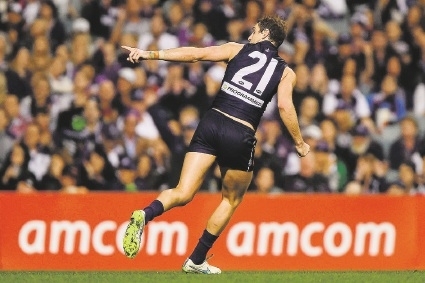 Sensing his moment had arrived, Barlow grasped it with both hands, quickly cementing himself as one of Fremantle’s most important players. In an impressive debut, Barlow had plenty of the ball and kicked two goals with the Dockers going on to demolish Adelaide. While a broken leg would ultimately cut short his first year in the competition, Barlow would return to his ball-winning best to form part of a midfield group that today rivals the best in the AFL. Currently playing for a side that sits top of the AFL ladder, Barlow said he was keen to continue the run and driven by team success. “I suppose in hindsight when I got drafted if I was told I was gonna play 100 games I would have jumped at it,” he said. “Right now it’s something I just want to continue going into 101 and 102 games, I play every week as if it’s basically like my grand final.